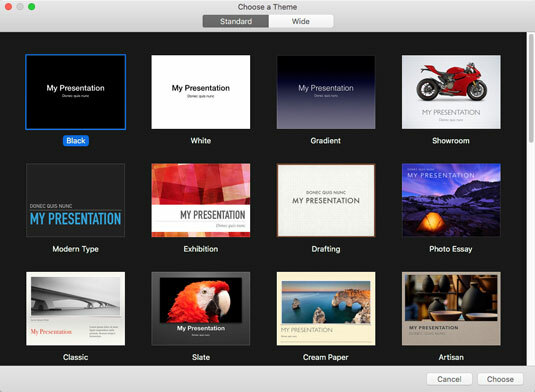 Cutting-edge presentation software like Keynote makes slide creation on your iMac easy and — believe it or not — fun! This is the application Steve Jobs once used for his Macworld keynotes every year. So much visual candy is available that you’ll never need to shout to wake your audience again. Even better, this jewel of an application is a free download from the App Store! Click the Launchpad icon on the Dock. Click the Keynote icon, which looks like a lectern. The familiar visage of the Open dialog appears. Click the New Document button at the lower-left corner of the Open dialog. Choose the aspect ratio, using either the Standard or Wide button at the top of the window. Click the theme thumbnail that most closely matches your needs. Click the Choose button to open a new document that uses the theme you selected. Select a template from the Theme Chooser window. Press Command +O to display the Open dialog. Click the desired drive in the Devices list at the left of the dialog; then click folders and subfolders until you locate the Keynote project. If the project is stored in your iCloud Drive, click the Keynote item under the iCloud heading in the sidebar at the left of the dialog, and then double-click the desired project thumbnail. If the project is stored on your hard drive, the All My Files location can quickly display all your documents. You can jump directly to any location or folder under the Favorites heading by simply clicking on the entry. Oh, and don’t forget that you can use the Search box at the top of the Open dialog to locate the document by name or by some of the text it contains. Double-click the filename to load it. If you want to open a Keynote document you’ve edited in the recent past, things get even easier — just choose File→ Open Recent, and you can open the document with a single click from the submenu that appears. If you’re saving a document that hasn’t yet been saved, the familiar Save As sheet appears. Enter a filename for your new document. From the Where pop-up menu, choose a location in which to save the document. By default, Keynote saves the project directly to your iCloud Drive (iCloud appears in the Where pop-up menu), making it available to other Macs and iOS devices using the same Apple ID. To select a location not available from the Where pop-up menu, click the button with the down-arrow symbol to expand the sheet. You can also create a new folder from the expanded sheet. You can create a version of a Keynote presentation by choosing File→ Save. To revert the current presentation to an older version, choose File →Revert To. Keynote gives you the option of reverting to the last saved version, or you can click Browse All Versions to browse multiple versions of the presentation and revert to any saved version. Slides list: Use this thumbnail list of all the slides in your project to navigate quickly. Click a thumbnail to switch instantly to that slide. The Slides list can also display your project in outline format, allowing you to check all your discussion points. (This is a great way to ferret out any “holes” in your presentation’s flow.) While in outline mode, you can still jump directly to any slide by clicking the slide’s title in the outline. To display the outline, choose View→ Outline. You can switch back to the default Navigator Slides list by choosing View→ Navigator. Layout pane: Your slide appears in its entirety in this pane. You can add elements to and edit the content of the slide from the Layout pane. Toolbar: As does the toolbar in Pages and Numbers, the Keynote toolbar makes it easy to find the most common controls you’ll use while designing and editing your slides. Clicking an icon on the toolbar performs an action, just as selecting a menu item does. Presenter Notes pane: You might decide to add notes to one or more slides — either for your own use or to print as additional information for your audience. Click the View icon on the toolbar, and select Show Presenter Notes (or choose View→ Show Presenter Notes) to open the Presenter Notes pane. This text box appears under the Layout pane. Inspector: Keynote displays this pane on the right side of the window when you click the Format button, allowing you to format selected text and images on the fly. The Keynote window is dominated by the Layout pane. Click the Add Slide button on the toolbar. Right-click an existing slide in the Slides list, and choose New Slide from the menu that appears. To move slides to different positions in the Slides list (that is, to change the order in your Keynote presentation), drag each slide thumbnail to the desired spot in the list. All the text, shapes, and graphics placeholders on your first Title slide appear within boxes. Keynote uses these boxes to manipulate text, shapes, and graphics. You can resize a box (and its contents) by clicking the box and dragging one of the handles that appear around the edges of the box. (The cursor changes into a double-sided arrow when you’re “in the zone.”) Side selection handles drag only the edge of the frame, whereas corner selection handles resize both adjoining edges of the selection frame. To keep the proportions of a box constrained, hold down Shift while dragging the box’s corner handles. Boxes make it easy to move text, shapes, and graphics together (as a single unit) to another location within the Layout pane. Click inside the box, and drag the box to the desired spot. Keynote displays alignment lines to help you align the box with other elements around it (or with regular divisions of the slide, like horizontal center). To select a box, click it. To select text, shapes, or graphics within a box (see the next section), double-click the box. When you’re resizing a photo in a box, hold down the Shift key while you drag the frame. Doing so tells Keynote to preserve the image’s aspect ratio so that the vertical and horizontal proportions remain fixed. You can also flip images horizontally or vertically from the Arrange menu.To delete an image, just click it to select it and press Delete. As with Pages, which also uses boxes for text layout, you can add or edit text in Keynote with ease. For example, say you have a box with the placeholder text Double-click to edit. Just double-click in that box, and the placeholder text disappears, leaving the field ready to accept new text. Any new text you type appears at the blinking cursor within the box. Add a new text box: Just click the Text button in the Keynote toolbar, and click one of the sample styles that appear. Your new text box appears in the middle of the slide. Edit existing text: Click — using the bar-shaped cursor to select just the right spot in the text — and drag the insertion cursor across the characters to highlight them. Type the replacement text, and Keynote obligingly replaces the old text with the new text you type. Delete text: Click and drag across the characters to highlight them; then press Delete. You can also delete an entire box and all its contents: Right-click the offending box, and choose Delete from the menu that appears. When a box’s contents are just right, and you’re finished entering or editing text, click anywhere outside the box to hide it from view. You can always click the text again to display the box later. Keynote doesn’t restrict you to the default fonts for the theme you choose. It’s easy to format the text in your slides — a different font family, font color, text alignment, and text attributes (such as bolding and italicizing) — on the fly. The Inspector: The font controls in the Inspector work in one of two ways: After you’ve selected text, either click a font control to display a pop-up menu, or click a button to immediately perform an action. Opening the Font Size pop-up menu, for example, displays a range of sizes for the selected text. With a single click of the B (bold) button, add the bold attribute to the highlighted characters. To create bullets and lists, click the Text tab at the top of the Inspector. The Format menu: When you select text, the controls on the Keynote Format menu generally mirror those in the Inspector. To change the alignment from the Format menu, click Format and hover the cursor over the Text menu item. To change text attributes, click Format and hover the cursor over the Font menu. As mentioned earlier, you can type presenter’s text notes in the Presenter Notes pane. I use them to display related topic points while presenting my slideshow. However, you can also print the notes for a project along with the slides, so presenter’s notes are also great for including reminders and To Do points for your audience in handouts. To type your notes, just click within the Presenter Notes pane. 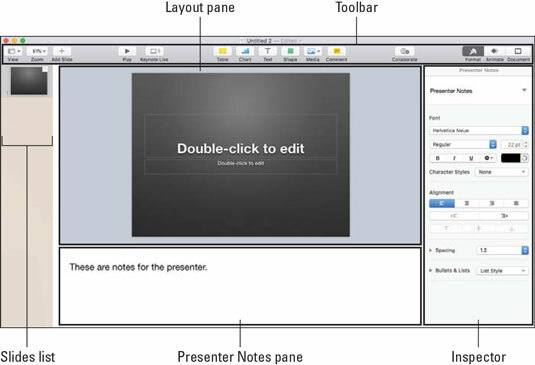 If that pane is hidden, choose View –> Show Presenter Notes, or click the View button at the far left of the Keynote toolbar and choose Show Presenter Notes. When you’re finished adding notes, click in the Slides list or the Layout pane to return to editing mode. 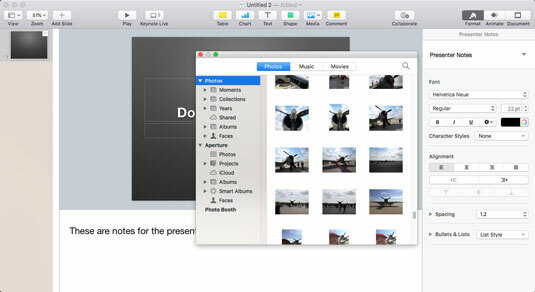 Adding audio, photos, and movies to a slide is drag-and-drop easy in Keynote. Simply drag an image, audio, or movie file from a Finder window, and place it at the spot you want within your document. Click the Media button on the toolbar, and then click the Photos, Music, or Movies tab to select the desired type. Keynote displays the contents of your various media collections (such as your Photos, iMovie and iTunes libraries). When you find the file you want to add, drag it to the spot you want in the document. The figure shows the Media Browser in action. It’s not just photos. You can add audio and movie clips to a slide too! Having trouble finding that specific photo or movie? Click the Search icon (which looks like a magnifying glass) at the top-right corner of the Media Browser, and you can specify a particular filename or keyword. Click the Shape button on the Keynote toolbar, and choose a shape. Click the center of the shape, and drag it to a new spot. When the shape is properly positioned and sized, select it, and choose Arrange → Send to Back. You want to “send the shape to the back” so that any text you enter sits in front of the shape, not hidden behind it. Of course, you’re not limited to creating shapes and graphics within Keynote; consider using an application like Adobe Photoshop or Illustrator to create graphics that you can import into your slides. As mentioned earlier, you can easily drag and drop your new graphic into a slide from a Finder window. The heart of a Keynote presentation is the slideshow you build from the slides you’ve created. A Keynote slideshow is typically presented as a full-screen presentation, with slides appearing in linear order as they are sorted in the Slides list. You run a Keynote slideshow simply by clicking the Play button on the toolbar or by choosing Play→ Play Slideshow. You can advance to the next slide by clicking, or by pressing the right bracket key, which looks like this: ]. Of course, other controls are available besides just the ones that advance to the next slide. The table lists the key shortcuts you’ll use most often during a slideshow. Keynote offers a number of settings you can tweak to fine-tune your slideshow. To display these settings, choose Keynote→Preferences, and click the Slideshow button in the Preferences window. If you have an iPhone, iPad, or iPod touch handy, and you’ve installed the iOS version of Keynote on your device, choose Keynote → Preferences to display the Preferences window. Click the Remotes tab to link your device to your iMac and Keynote. Now you can use your handheld device as a remote during your slideshow. Sweet! I’ll be honest: I don’t print handouts for every presentation I give. However, if you’re presenting a lengthy slideshow with plenty of information you want your audience to remember or refer to later, nothing beats handouts that include scaled-down images of your slides (and, optionally, your presenter’s notes). You’re not limited to paper, though. You can also use Keynote to create an electronic PDF (Portable Document Format) file instead of a printed handout, which your audience members can download from your website. Or, if you’re an educator with access to an interactive whiteboard (such as a SMART Board), you can use this cutting-edge technology with Keynote. 1. Within Keynote, choose File→ Print or press Command +P. Keynote displays the Print sheet, shown in the following figure. (Note that some printer-specific features may be different on your screen.) If necessary, expand the Print sheet to show all the settings by clicking the Show Details button at the bottom of the sheet. Slide: Print each slide on a separate page at full size. You can optionally choose to print the presenter notes for each slide as well. Grid: Print multiple slides on a page at a reduced size. From the Slides per Page pop-up menu, specify how many slides Keynote should print on each page. Handout: Print a handout with multiple slides per page (and, optionally, with presenter’s notes). Again, you can choose how many slides appear on each page. Outline: Print the contents of your Slides list in Outline view. To print the entire document, select the All radio button. To print a range of selected slides, select the From radio button, and then enter the starting and ending pages. 4. Select or deselect additional options from the Options section. 5. Click the Print button to send the job to your printer. Keynote offers a wide range of printing options for your slides and notes. You can also send a copy of your finished presentation as an attachment within Mail or Messages, or you can provide others with a copy through Twitter or Facebook. Click Share→Send a Copy to explore your options. To share your presentation with others (allowing them to view or edit your work), click the Collaborate button on the toolbar and specify who should receive a sharing invitation!